Savor three distinct flavors of Asia as you travel from Bangkok to Singapore on the Eastern & Oriental Express, experiencing the lush, pastoral countryside of Thailand and Malaysia along the way. Continue on to Bali, exploring remote jungles, pristine beaches and exotic temples. Arrive in Bangkok, where you are met and swiftly moved through customs before being transferred to your hotel on the banks of the Chao Phraya River. Take a short cruise from your hotel and continue by tuk-tuk to the Grand Palace, the official residence of the kings of Siam and later, Thailand. Visit the Emerald Buddha Temple, regarded as the most important Buddhist temple in Thailand. It contains an image of Buddha flawlessly carved from a single block of jade. 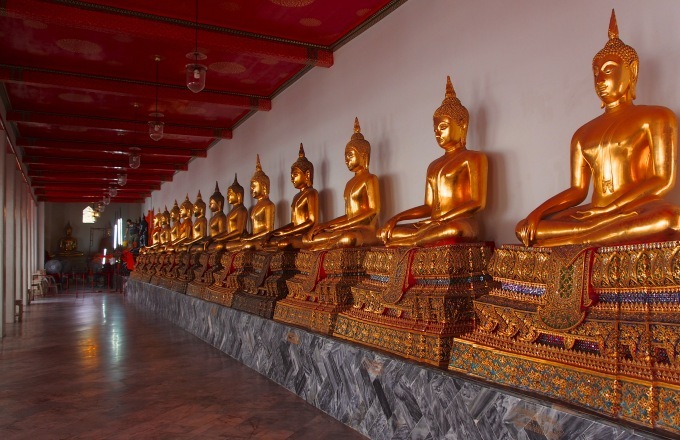 Tour the temple of Wat Pho to view its gilded, 160-foot-long Reclining Buddha, while the musical sound of coins tossed into brass offering bowls punctuate your experience. At lunch, enjoy a special Thai cooking demonstration. This evening, gather with fellow guests for a cocktail and welcome dinner. Visit a local temple to witness a Thai Buddhist blessing ceremony. After some time at leisure, transfer to the railway station and board the iconic green-and-gold coaches of the Eastern & Oriental Express. Savor a superb dinner in the dining car as the train travels out into the countryside, passing rice fields, villages and water buffalo. Throughout your journey, take in sweeping views of the lush scenery from the colonial-style, teakwood observation car. Retire to your cabin, transformed from a private lounge with banquette-style sofa into a cozy bedroom, all by your steward, who is at your service around the clock. Travel to the Wang Po wooden trestle bridge, an engineering marvel suspended beside a towering cliff. Disembark to board a boat at the nearby River Kwai Bridge station. Float down the Kwai Yai River with your fellow passengers as you learn from a local historian about the infamous span built by allied prisoners of war under the command of the occupying Japanese army during World War II. Back on shore, stop by the Thailand- Burma Railway Centre and Don Rak War Cemetery to gain a fuller appreciation for what remains a monumental achievement under extreme conditions, as dramatized in the classic 1957 film, The Bridge on the River Kwai. Reboard the train and roll onward into Malaysia before gathering in the dining car for an elegant formal dinner. Indulge in a leisurely breakfast in your cabin as your train intersects picturesque limestone massifs rearing from rice fields. Spend the morning relaxing in the observation car or saloon lounge, watching the passing scenery. Lunch is served before arrival into Kuala Kangsar. Disembark for your guided tour of this fascinating royal town, where you visit the Ubudiah Mosque, one of Malaysia’s most majestic. Next, explore the Royal Museum of Perak, an ornate structure originally built for Sultan Iskandar Shah in 1926. Constructed entirely of wood and woven bamboo, the building was erected without the use of a single nail. Continue on to view works at the Sultan Shah Gallery. Rejoin the train as it continues southward through the lush rainforests and rural west coast towns of peninsular Malaysia. Tonight on board, dress for dinner and enjoy a nightcap in the piano bar on the final evening of your elegant journey by rail. Arrive in Singapore, where you are greeted with an orchid garland. Get your first glimpse of this diverse and dynamic “City in a Garden” as you drive through the Civic District, arriving at your luxurious hotel to check in, get settled and enjoy lunch. Enjoy an afternoon at leisure exploring the city on your own, shopping an eclectic mix of stores, or relaxing in the hotel. Later in the evening, gather with your fellow travellers for dinner at a local restaurant. Begin with a visit to the National Orchid Garden, a lush oasis boasting a colorful display of 60,000 orchids representing 400 species and more than 2,000 hybrids. Keep a careful lookout for Vanda, or “Miss Joaquim,” Singapore’s national flower. Continue on to explore a taste of Singapore’s diverse international flavor with a visit to Little India and Arab Street’s Sultan Mosque. Next, take in the harbor-side vistas of Merlion Park before pausing for lunch at a local restaurant. Afterward, embark on an afternoon bumboat cruise down the Singapore River into Clarke Quay. Then, continue to Thian Hock Keng Temple, one of Singapore’s oldest Buddhist-Taoist temples, and explore Singapore’s Chinatown market. Later, tour Katong and Joo Chiat, two bustling enclaves showcasing the city’s rich baroque Peranakan architecture. Begin with an excursion to the rocky coastal outcropping of Tanah Lot Temple, the most iconic in a chain of sea temples that dot the coastline. Highly venerated by the Balinese, the solemn temple sits atop a striking tower rock that is isolated from the shore by the sea at high tide. Try your hand at capturing this, the most photographed temple in Bali, before continuing inland through lush tropical forests and mountains to the island’s cultural heartland, Ubud. After lunch at a local restaurant, head out on your own to explore the village’s tradition of craftsmanship, strolling among artisan shops surrounded by lush rice paddies and sacred shrines. Continue to the Holy Water Temple of Sebatu to watch as Hindu pilgrims partake in a spiritual cleanse, joyfully splashing in the sacred, curative waters fed by the fountain’s cascading spigots. Enjoy a morning of leisure at your hotel, perhaps indulging in a spa treatment, lounging on the beach, or playing a game of tennis. Gather for a farewell luncheon at the hotel’s beachside restaurant, trading stories and photos with your fellow guests. Head out for one final excursion exploring the famous Pura Luhur Uluwatu Temple, one of the region’s most revered sacred sites. Perched 250 feet above the water on a sheer cliff, it offers a perfect vantage point to the beach below, one of the island’s best surf spots. Watch the huge waves roll in and crash against the cliffs — and keep an eye out for the playful monkeys that inhabit the area. At sunset, take in a captivating Kecak Dance as you overlook the ocean from atop a towering cliff. Dating from the 1930’s, this mesmerizing performance blends Hindu traditions with Western influences, culminating in a spectacle of hypnotic chanting, elaborate costume and rhythmic dancing. Reflect on your incredible journey as the sun bathes the sea and sky in the ebbing glow of twilight. After breakfast, transfer to the airport and depart for your international flight home. Last group event: end of sightseeing at 8:00 p.m. on Day 10.